Mention uranium and most people connect the word with nuclear energy rather than collectables. However, this material was used in the 1830s by a Bohemian glass- maker, Joseph Riedel, who used it to colour his products yellow or green. More than 65 years later, uranium was again used in the manufacture of yellow glass - when combined with other minerals and re-heated, it produced a shading effect from yellow to milky white at the rim. This, in turn, gave rise to the term 'Vaseline' glass (because its look resembled the ointment). 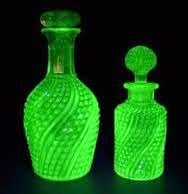 In fact, the defining quality uranium glass is rather more decorative: it will glow under ultra-violet light (usually fluorescing lime green). 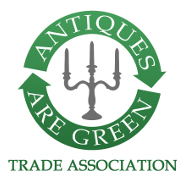 This makes it easy to test for - you can see the effect simply by using a small battery-operated 'black' light, a UV lamp available from big antique fairs or specialist lighting suppliers. But it also means that you can create an impressive and magically luminous display. Tyneside manufacturer George Davidson who patented his Pearline process in 1889 and produced the most comprehensive and prolific range of the time. "Davidson's Pearline was, by definition, the gradual fading from clear colour to a white opacity though the colour might be yellow, blue or even a clear glass version which he called Moonshine. The style was quickly picked up by many of Davidson's competitors in the North of England and wasn't long in crossing the Atlantic. Among the English companies following in Davidson's footsteps were Greener and Sowerby (which, in the i88os, was reputed to have been the largest pressed glass factory in the world). Both produced Vaseline glass which is much sought after today. Less known English manufacturers include Burtles, Tate & Co. and Richardson of Stourbridge (which used only a small amount of uranium to produce a thin, light colour). 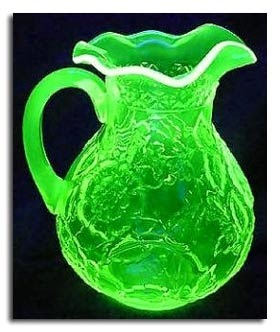 Virtually all of Davidson's uranium glass was opalescent: the very occasional piece which isn't comes from designs produced while he was preparing his Peartine patent. "British Vaseline glass is almost always Victorian" says John. "There was very little Pearline made after about 1903 because, as electricity came in, these pieces stopped showing their advantage: they had been made to imitate the facets of cut glass so that they would twinkle, reflecting the light from oil lamps and candles." To give this effect, moulds were created to a very high standard. Despite the high levels of craftsmanship, prices for English Vaseline glass of this period and in perfect condition start from about $75-£50. US Vaseline glass is generally slightly later. "It was around the turn of the century that American makers began to pick up on this patent and this style. There's not a lot before that and the vast bulk of American Vaseline glass dates from the 1920s on wards .By that time, fashions in pressed glass had moved away from cut-glass imitation. Less time was spent on moulds with intricate details as producers could not afford the luxury of Victorian standards and many glass makers turned their artistic skills to Art Glass and away from everyday household objects. 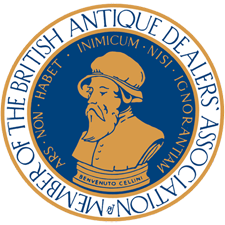 While little American Vaseline glass was imported into the UK, there is great interest in the States in English examples - as well as in pieces produced there. 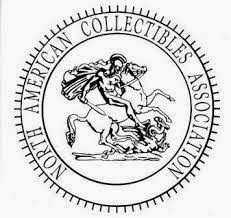 So much so, that a collectors' organisation known as Vaseline Glass Collectors Inc. was started in the US over 10 years ago. Vaseline glass has increased greatly over the past few years in the USA. Hobbs, Riverside, Belmont, Central, Beatty, Duncan Miller and Fostoria as older companies worth looking out for as well as Fenton ,there is a wealth of different items to choose from with some people collecting by manufacturer or shape, or focusing on particular items such as salts, toothpick holders, vases, creamers, goblets, cruets or syrup dispensers. As in the UK, prices generally vary from around $100-$500- £60 to £350. Vaseline glass collectors are primarily interested in yellow or yellow-green glass, with each individual having their own favorite shade. However, uranium produces glass colors ranging from amber through shades of yellow to bright apple green and even deep red, depending on the mixture. 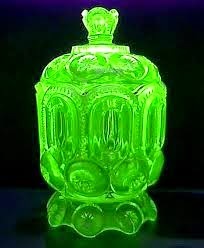 And, as well as Vaseline glass, uranium has been used in other types of glass like Burmese (yellow changing towards a rosy pink) and some Custard (opaque yellow). In addition, it was used for some Depression glass - a term which covers assorted brightly coloured glassware produced in 1930s* America as a cheap alternative to china. 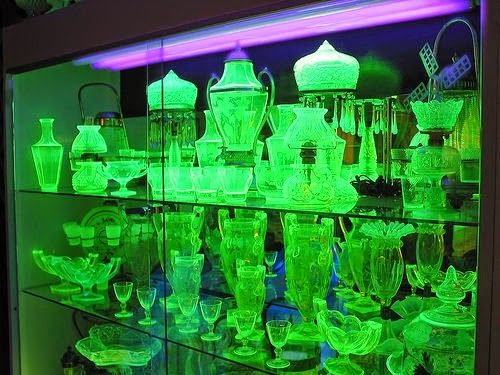 Only a small percentage of Depression glass colors would have included uranium. 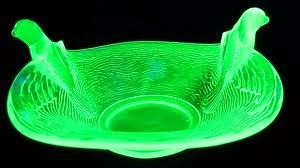 During the 1940s, the use of uranium in glass was banned over fears for the health of glass workers and because governments wanted to restrict its use for military reasons. 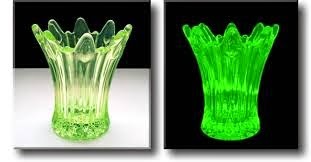 it was lifted in the US in the 1950s and a range of companies there now use uranium to produce both repro and modern Vaseline glass pieces. 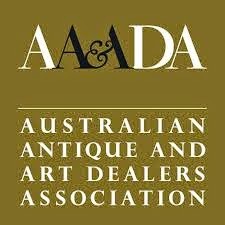 As with all collectibles, it is important to learn as much as you can before buying.